The inspiration behind this wine is a man by the name of Byron. A Wisconsin native born in the early 1920's, he left the farm at the age of 15 in search of a better life. Falsifying documents and lying about his age, he joined the Merchant Marines and traveled around the world visiting exotic ports. Byron embraced the sailor lifestyle and subsequently the tattoos that showed as a badge of honor. With each new port, a new experience and a new tattoo. He helped aid the Allied forces in WWII and, at times, was forced to sail through enemy waters to reach their port. One of those times, his ship was torpedod, leaving Byron and a few sailors on a life raft in the pacific. Those who survived spent five days adrift at sea before being rescued. The name Sailor's Grave was a common tattoo that sailors got, not knowing if they would return home from sea. In Byron's case, the tattoos are not only a roadmap of past adventures, but symbolize the struggles and hardships he underwent in a life that few could imagine and even fewer have experienced. Byron was a man driven by exploration and discovery. 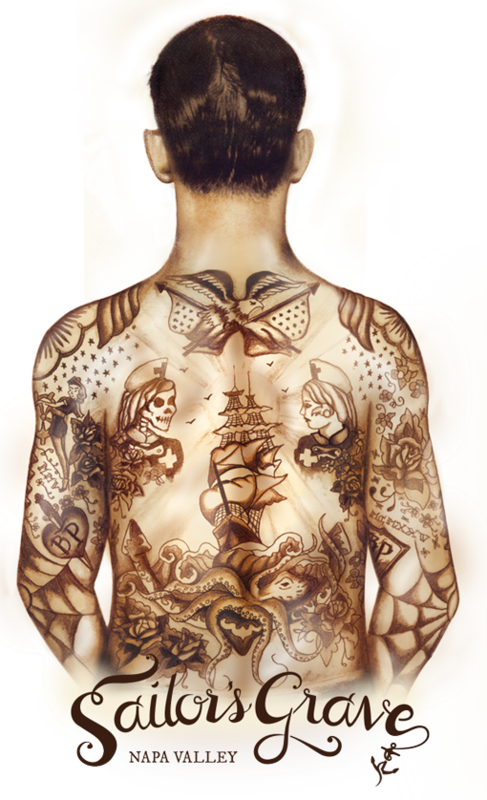 He shares these experiences through his tattoos which we are happy to capture with this wine, Sailor's Grave. As Byron grew out of his teens, he decided to go to officer school to become an engineer. Having never finished highschool, Byron was the youngest to ever graduate the program at the time. Having impressed his instructors so much by finishing top of his class, he was asked to stay and teach incoming candidates. However, he refused; following his heart back into open waters as a merchant marine. World War II was beginning and many rushed to aid in the war effort; Byron included. While he was out to sea however, a draft notice was issued but couldn't reach him half way around the world, and therefore when he arrived in Louisanna he was arrested for failure to report. Byron was furious at the mistake that landed him in jail. He refused to join the general infantry as he had already achieved officer creditentials, and was actively contributing to the war effort. Eventually they agreed to released him, whereupon he rejoined active duty on his ship. After his travels sailing around the world, Byron moved to California to join his father who in 1948 had planted 35 acres of Zinfandel in Healdsburg, Sonoma County. Some of these original vines still exist today and can be seen at the end of Pozzan Road. After some time he found a wife and settled down in the east bay outside of San Francisco where he had two children. It just so happens that his son Michael, who spent his summers with his grandfather, gained a passion for wine and later founded Michael Pozzan Winery. Sailor's Grave is Michael's way to pay tribute to his father who passed in October of 2004.